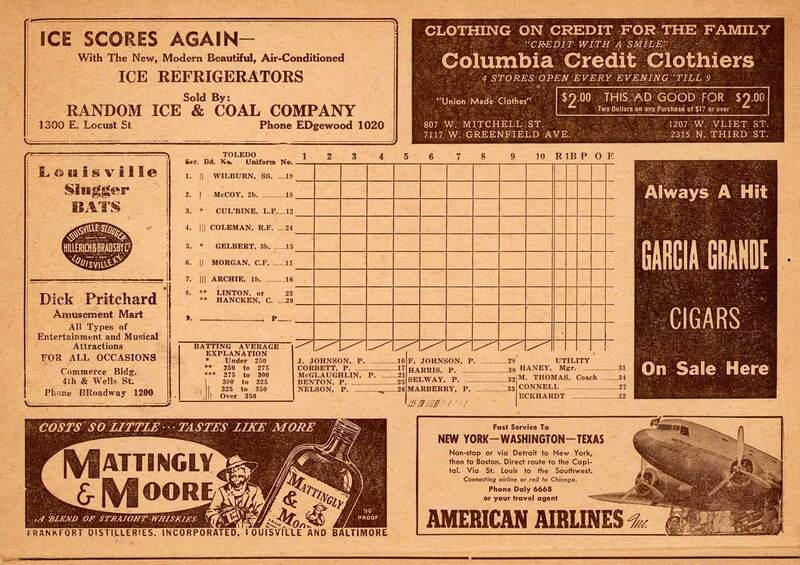 This score card was sold at Borchert Field during the 1938 season. 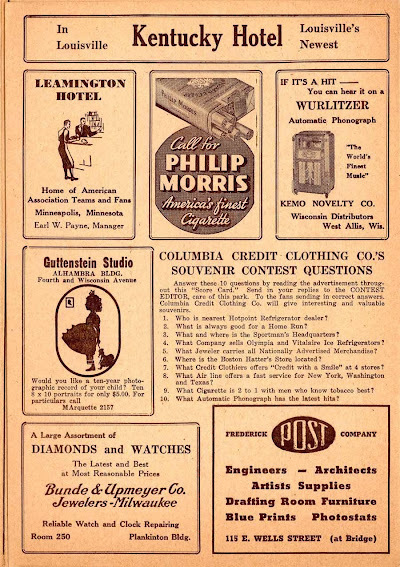 The print is single-color brown on one long piece of cardstock, gatefolded into a 7 x 10 inch scorecard and sold for 5 cents (which seems to have been standard back to 1914). One other thing that never seemed to change: Lucky Number contests. 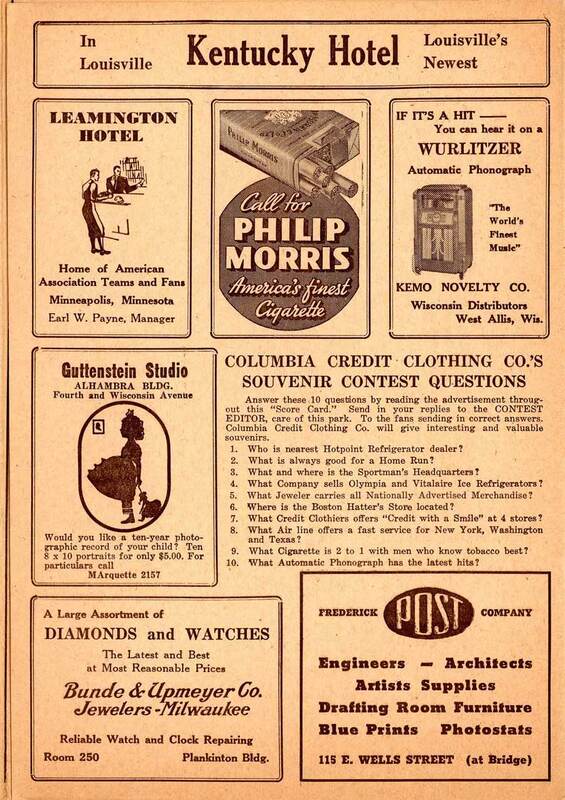 This one's even better: a trivia quiz about the advertisements, just to make sure you were actually reading them. Whit Wyatt was the Brewers' ace in 1938 finishing with a record of 23-7. No wonder he was so popular at the Orchard. He had come to the Brewers from the American League, where he had pitched for the Tigers, White Sox and Indians. The Brewers sold him to the Dodgers at the end of the season. With "Dem Bums" in September of 1941, Wyatt no-hit the Boston Braves to clinch a pennant for Brooklyn. In second place at the time was Oscar Grimes. 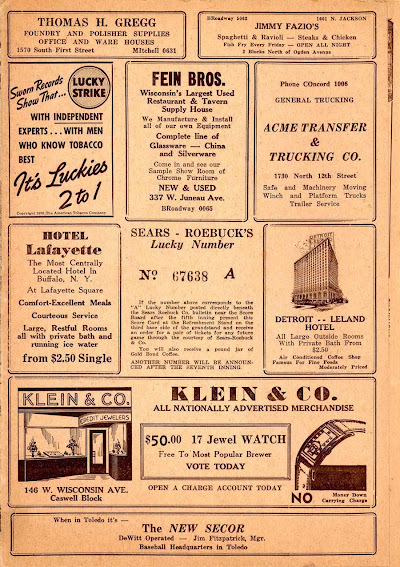 He played second for the Brews in 1938, and went on to a nine-year major league career with Cleveland, the Yankees and Philadelphia Athletics. 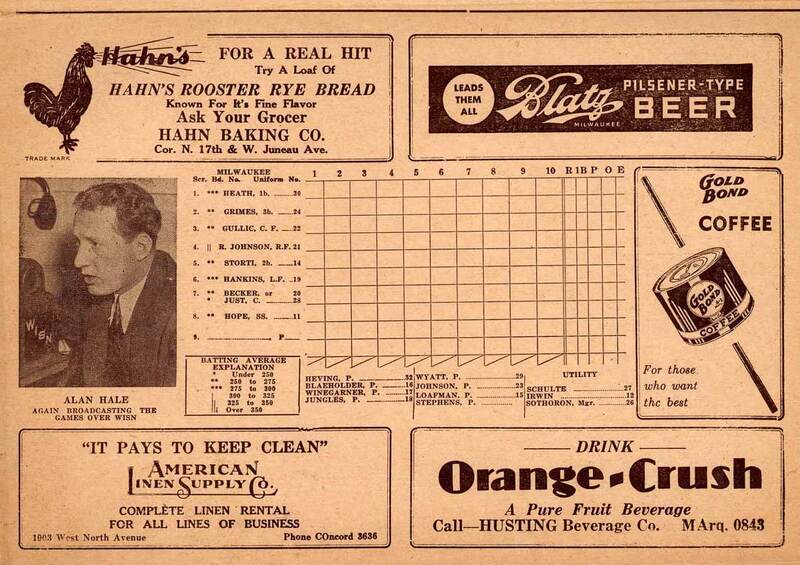 William "Rush" Hankins, backup catcher and jack-of-all trades, was coming in third. He had a promising season before being sold to the Minneapolis Millers, who shipped him off to the Williamsport (PA) Grays. 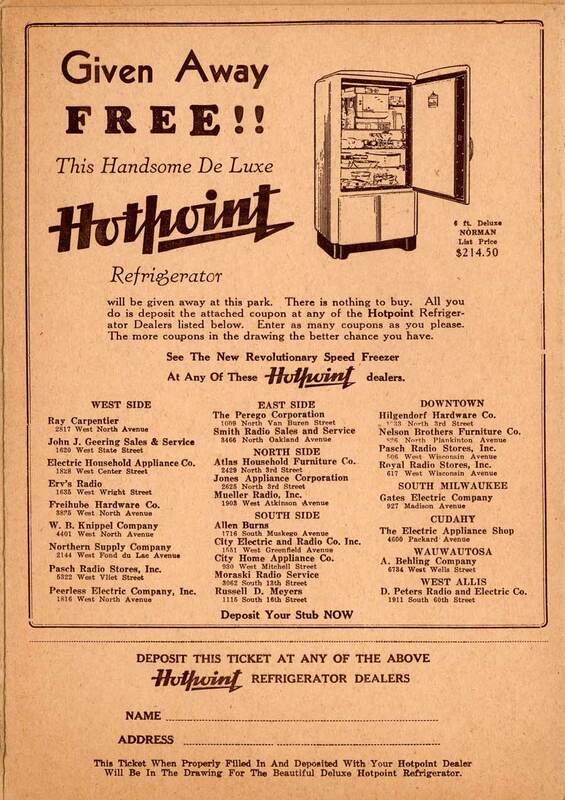 He returned to the Brewers for one more disappointing season in 1940. Fourth place was Mickey Heath, popular first baseman. He would eventually become player/manager, then coach and broadcaster. In fifth place, bringing up the rear, we have right-handed pitcher Joe Heving. 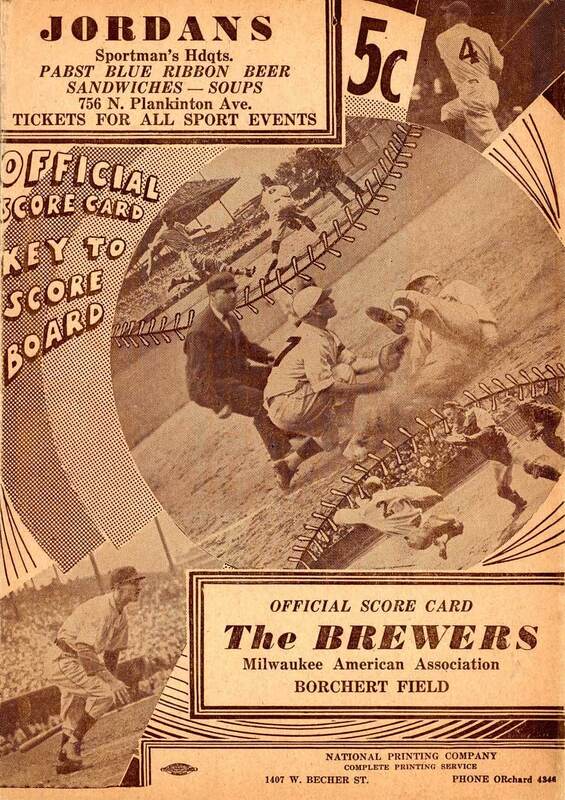 Heving was an instrumental part of the Brewers' pennant-winning club in 1936, and following the '38 season was sold to the Red Sox. 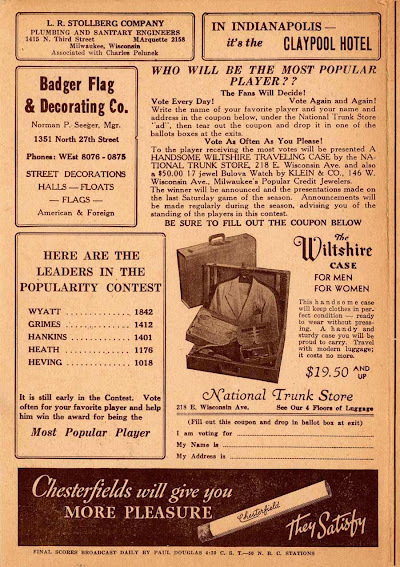 In order to vote, a fan had to tear out a section of the score card and drop it in a ballot box at one of Borchert Field's exits. 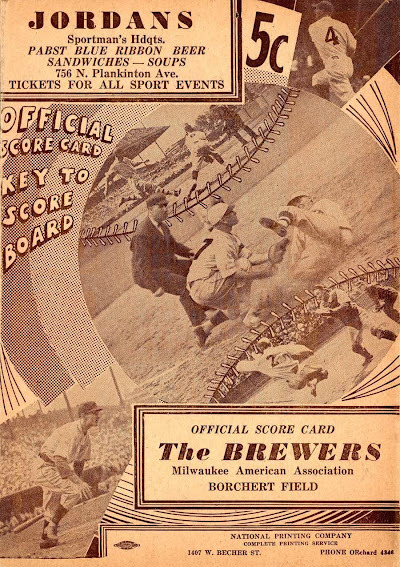 The next two pages detail the lineups for this particular game, the Toledo Mud Hens on the first and the hometown Brewers on the second. That's Fred Haney managing the Hens. He would of course go to become an important part of Cream City baseball history as manager of the Milwaukee Braves in 1957 and 1958. Interestingly, according to this there was not a single starting player on either club wearing a jersey number in the single digits. There's team broadcaster Alan Hale there at the WISN microphone. Another page, another Lucky Number contest. This one was sponsored by Klein & Co. I'm also intrigued by the notion that you could buy tomato juice "in glass bottles" at the ballpark; somehow I don't think they were giving Miller High Life a run for its money. 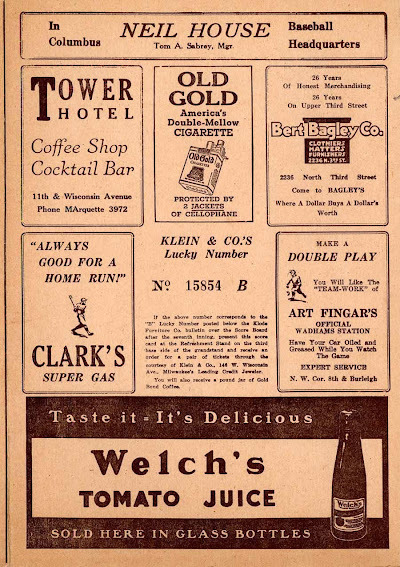 Clark's Super Gas is "always good for a home run." Clark's would become an important sponsor of the Brews in later years, with their logo on the cover of every score card from at least 1942 through the 1950s. Finally, we get to the back cover. 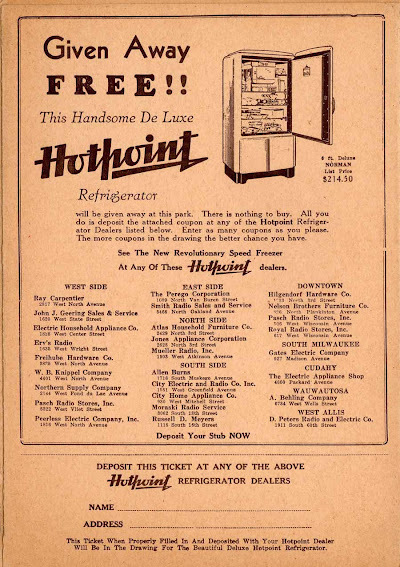 Traditionally reserved for a beer ad, we instead get a full-pager for Hotpoint refrigerators. 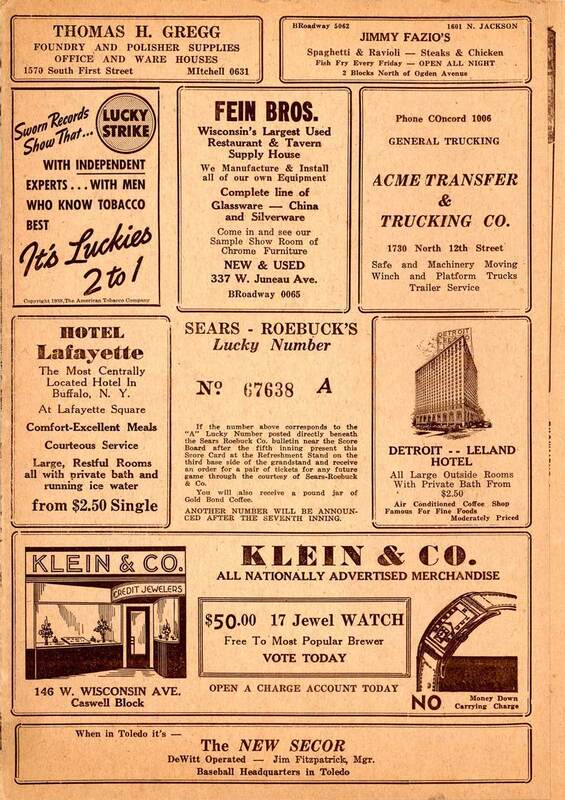 Another tear-off coupon; it's a wonder that any score cards survived intact.